From 1959 to 1964, one would see this heading as the slogan on license plates of all cars registered in the state of Oregon, the 33rd state to join the United States. I don’t know why they later changed it to “Things Look Different Here” and, eventually, to the current “We Love Dreamers.” Nevertheless, all three give an indication of the beautiful attractions the state offers. Just a few weeks ago, I had the chance to go around some of the tourist attractions of this alluring Pacific Northwest state, courtesy of my younger sister, Esper, who drove me around the destinations that tourists flock to. First stop was at the Observatory of the Oregon Health and Science University, a public university in Portland which also runs two hospitals. The well-constructed lookout on top of a hill, where one of the hospitals, my younger sister’s place of work, is located, may be reached through an aerial tram ride. It offers a breathtaking panoramic view of the city of Portland and, at night, it is exhilarating to see all those city lights sparkling like diamonds. While we were en route to another attraction the following day, the majestic Mount Hood appeared before us on the freeway. Since it is usually covered with snow most of the year, it practically glistens in the horizon, making it even more attractive. 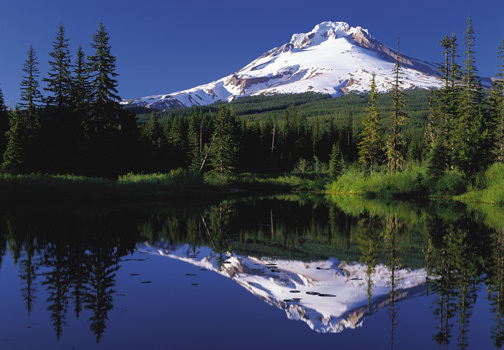 It is also the highest mountain in Oregon and is called Wy’east by the Multnomah Tribe of Native Americans that used to populate the area. 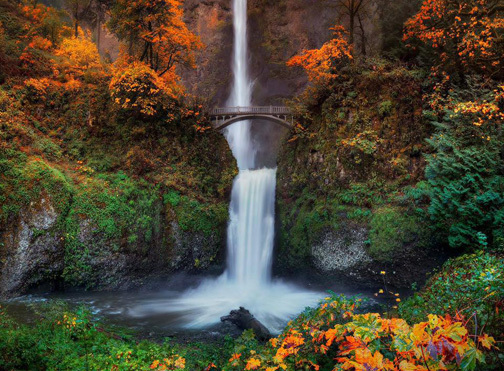 Our main destination that day was the Multnomah Falls, a picturesque waterfall that drops 620 feet, and was featured in the 2017 movie, The Shack. It was a very cold, windy day when we went there, and cold mist from the waterfalls made the situation even worse for tropical creatures like me! But, when you’re right there, in front of that awesome wonder of nature, you forget the freezing temperature and just reach out for your camera to take several shots! There is even a 2.4-mile trail that climbs up 600 feet to the top of the falls. I saw a lot of young visitors going toward that direction after their respective photo ops in front of the falls. At my age and physical condition, I left the younger ones do the climbing, and limited myself to marvel at such magnificent creation from the ground level. Nevertheless, I’m pleased to have been one of the 2 million visitors that are awestruck by this natural attraction every year. 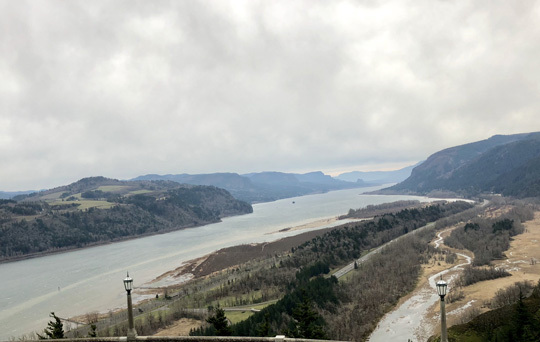 We then drove to Vista House, a museum 733 feet above the ground, on top of a rocky promontory, and offering a breathtaking view of the historic Columbia River, the largest in the Pacific Northwest. In the early days, this body of water was the main route of the pioneers, establishing trade and commerce in the settlements along it. The extremely windy conditions at the top, paired with the 2-degree Centigrade weather, discouraged us from staying longer. After we captured on camera the spectacular view of the river, we left. The historic Columbia River, as seen from the Vista House, 733 feet above the ground. Done with marvelling at nature, we went on to be amazed by something man-made. We drove to the Nike World Headquarters at Beaverton in the outskirts of Portland. I have always liked this very popular brand, which is named after the winged Greek goddess of Victory, and have often wondered what made Phil Knight, the owner, put up such profitable business venture. He was really into sports at a very young age. 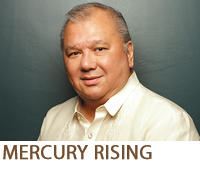 In fact, when his newspaper-publisher father refused to give him a summer job at his newspaper, Phil worked for the rival paper, at night, tabulating sports scores, then ran the seven-mile distance to his house in the morning. His college days saw him as a sports reporter for another newspaper, and as a middle-distance runner, with Bill Bowerman as his coach. Both of them eventually founded Nike together. But the most interesting trivia I learned during our visit was that of the Nike logo, the very strong, powerful, and highly popular swoosh design. Knight and Bowerman needed a logo for a new line of running shoes they were going to introduce in their Blue Ribbon Sports, the original name of the Nike enterprise. They approached a graphic design student, Carolyn Davidson, with specific instructions that the logo must look like speed! She submitted five sketches, one of which was the swoosh, which they chose, and which Davidson sold to them for only US$35. That was in 1971. For our Sunday spiritual nourishment, my sister brought me to The Grotto, formally known as the National Sanctuary of our Sorrowful Mother. 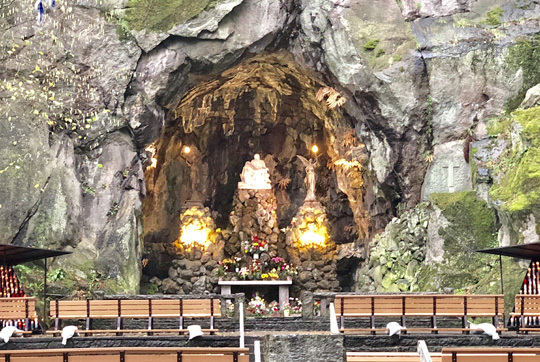 Located within the city of Portland, it is a 25-hectare outdoor Catholic shrine constructed in 1924 by the Order of Friar Servants of Mary, popularly known as the Servite Friars. Portland’s 95-year-old The Grotto is very accessible to tourists as it is within the city. The main grotto itself features the image of the Pieta, and it has a large meditation hall, and a trail that features the Stations of the Cross through several botanical gardens. I would have wanted to check out the whole place but it was drizzling when we went, and we didn’t have any umbrella, so my soaked sweater was turning me into a frozen popsicle. We then decided to drive around in the comfortable heated interior of the car. My sister already warned me that one visit to Oregon is never enough to see everything tourists need to see. I know there are still the beautiful coast, the crystal-clear lakes, and deserts that would thrill any first-time visitor. So I’m convinced: “Things DO Look Different Here.” Another visit to Oregon? Of course!